Our galaxy's dark matter is clumpier than once thought,according to a new computer simulation. The model, created by one of the most powerfulsupercomputers in the world, shows that the spherical halo of darkmatter that envelopes the Milky Way contains dense clumps and streams ofthe mysterious stuff, even in the neighborhood of our solar system. 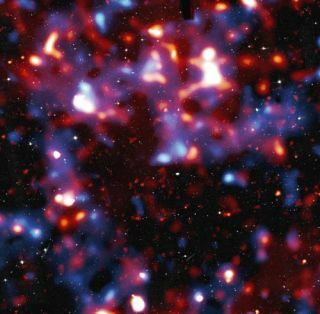 "In previous simulations, this region came out smooth,but now we have enough detail to see clumps of dark matter," saidresearcher Piero Madau, an astrophysicist at the University of California,Santa Cruz. Dark matter, which scientists can only detect by noting itsgravitational effect, is thought to make up about 85percent of the matter in the universe. Its composition remains a mystery,though some scientists think it's made up of hypothetical particles calledWIMPs (weakly interacting massive particles), which could annihilate each otherand emit gamma rays when they collide. The new simulation, described in the Aug. 7 issue of thejournal Nature, implies that dark matter could be detected by therecently launched Gamma-ray Large Area Space Telescope (GLAST). "That's what makes this exciting," Madau said. "Some of those clumps are so dense they will emit a lot of gamma rays ifthere is dark matter annihilation, and it might easily be detected byGLAST." So far, though many teams have been looking for WIMPparticles, no one has conclusively detected them. "There are several candidate particles for cold darkmatter, and our predictions for GLAST depend on the assumed particle type andits properties," said Juerg Diemand, a postdoctoral fellow at UCSC who ledthe new research. "For typical WIMPs, anywhere from a handful to a fewdozen clear signals should stand out from the gamma-ray background after twoyears of observations. That would be a big discovery for GLAST." The model took about one month to run on the Jaguarsupercomputer at Oak Ridge National Laboratory in Tennessee. By following thegravitational interactions of more than a billion parcels of dark matter over13.7 billion years, the computer could predict how the dark matter in theuniverse developed over time based on leading theories of how dark matterinteracts. "It simulates the dark matter distribution from nearthe time of the Big Bang until the present epoch, so practically the entire ageof the universe, and focuses on resolving the halo around a galaxy like theMilky Way," Diemand said. The research was funded by the U.S. Department of Energy,NASA and the Swiss National Science Foundation.